IE 6 or Firefox 1.x. The Logan County Business Directory is now available in both the print and ONLINE versions. Ask for the print edition at Logan County businesses. Click on this button in LDN for the ONLINE edition. Convenient links to local government that works for you. 12 weekly contests, still 10 more chances to win. 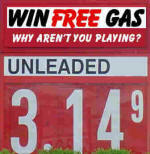 Enter the contest to win a $50 gas card. Do you like the contest, dislike the contest? Too easy, too hard? No time to play? Please give us feedback. Click here. Something new in your business? Garage Sale Central - only $5 for a whole week! Employment: NEED A JOB? FIND IT HERE! It's Garage Sale Season. Click here for listings. Looking or buying, check LDN Classifieds for homes and autos. Was an author named Richard the first person to discover electricity? LDN publishes all obituaries free of charge and accepts pictures for obits free of charge. The full text of the obituaries is available online free of charge in Logan County and across the world. E-mail condolences are available from subscribing funeral homes. Ask your funeral director to make sure the obituary of your loved one is placed in Lincoln Daily News.